Solar Power For Homes. Household solar power strategies. Not all household solar power options are costly. Go Greener with Solar Power for Homes and Gardens. Passive, thermal and solar power electricity, are all renewable solar power options. Here's how to harness them for home use. Solar Power for Home Use. Going green at home is easier today than it was yesterday and it'll be easier tomorrow than it is today. That's because more and more, corporations are introducing green product lines and researchers are making alternatives like solar power for homes more accessible to us. We want Green - and we've been sending a clear message to big business by making choices that have less impact on our environment and they hear us. Solar energy has become more mainstream in products like lighting, water pumps and water heaters and new technologies are even making the production of solar power "electricity" (photovoltaics & thin film) a less costly option. Any solar plan must begin with reducing the amount of energy you use if your goal is to keep expenses and negative impact at a minimum. Start with the simplest and least expensive methods for using solar power. Electricity needs, once you've pared your consumption (not to mention cost) down to a manageable level, should be at a minimum before you start. Solar power for homes comes in more than one form and not all of them are expensive. Passive solar can cost little or nothing to incorporate on your property. Passive design elements are used to take advantage of the sun and it's position during the different seasons. In hot seasons the sun is discouraged from entering the house and in cold seasons it's warmth and light is encouraged. The sun's heat can also be converted into inexpensive solar power for homes using thermal collectors which transfer heat to household or swimming pool water and even to rooms in a home. When using solar power, electricity production is what costs the big bucks. The answer is yes... and... no. Solar electricity is 12 volt or DC (direct current - the kind you get in batteries) energy. Not the same as the 110 or AC (alternating current - the kind your toaster uses). Solar (DC) energy can be used in it's pure form to run anything that runs on a battery. BUT, you can turn DC power into AC power using an inverter. Added to a household solar power system the inverter converts the solar power energy (DC) into household power (AC). This is where photovoltaics come into the picture. Solar panels are also referred to as photovoltaic (photo = light, voltaic = energy) panels and it is these (and thin film) that actually make electricity. This is where the cost of household solar power takes a sharp upward turn. Some solar power systems (pumps in particular) will not require battery back up, another savings in money and time. If you plan to go big with solar power, energy conservation is the place to start. Cutting down on household energy consumption will reduce the number of solar panels you'll need to run your household and the amount of money you'll spend overall. Before you buy a solar array to power your home check out our suggestions below for developing a system that covers all of your needs at the lowest cost. Choose a little or a lot of household solar power. For homes, gardens and vacation properties there's a huge and growing range of solar options available. The choices are up to you... hot water, solar pumps, swimming pool needs, garden lighting or solar electricity for the whole house. Choosing solar power for homes and gardens, is a giant green footstep toward maintaining a healthy planet. The links below will take you to "in depth" information on each subject. How to establish Solar Power for Homes and Beautiful Back Yards. Use the endless power of the sun to heat and light your premises, just by encouraging the light and heat rays to enter where you want them and discouraging solar entrance where you don't. This form of solar capture is known as passive solar energy, the simplest way of using solar power, and it's inexpensive... sometimes even free. more passive solar energy. Water pumps lend themselves very well to solar energy. Solar pumps (DC pumps), when coupled with solar panels work while the sun shines on the panels. For many applications - a swimming pool for example - you only need a pump to work for a few hours a day. This is one of the most ideal ways to use solar energy requiring neither batteries nor an inverter. Batteries and inverters add expense, require maintenance and periodic replacement as well as take up space. Eliminating batteries from the mix makes for a less expensive and low maintenance system. There's more great news about solar pumps here. More solar water pumps. Water heating represents about one third of your household energy cost. Solar water heaters are relatively inexpensive (payback time is 1 to 7 years) and can take on the task of water heating for an entire household or a swimming pool. You can even make your own water heaters. For more information and videos. Photovoltaic panels or PV panels are used to convert the sunlight that strikes the panel into solar power "electricity". When people talk about how expensive solar energy is they're talking about photovoltaics. The cost is coming down..slowly, and the introduction of thin film technologies may bring solar prices down to earth. New technology has ushered in a new kid on the block. 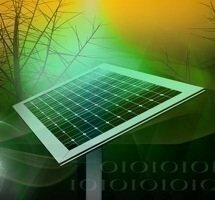 Thin film, combines nano technology with solar, making a solar collector that is so tiny it can be incorporated into paints, fabrics and building materials. Almost any surface can potentially become a solar energy panel. Now that's exciting! Solar power for homes and landscaping lines up with a myriad of techniques, products and attitudes that are paving a greener road, a road that will lead the way to a more sustainable future. Residential Solar Power - Off grid or grid tied solar power for homes?